This is a ‘reprint’ of an article I’ve written for our company (TAH Ltd) magazine. So on the 23rd May 2009 (the last Bank holiday Saturday in May), I was up at 5.30 in the morning, and on the road driving down to Taunton in Somerset. Mad, absolutely. But it was lovely weather, and sunny, before the bank holiday traffic hit the road, and air conditioning in the car always makes for a pleasant drive. I also got to see Stonehenge appear, through the early morning mist, which was incredible. No picture of that though, as I was driving…. Anyway, why was I up and out that that unearthly time ? 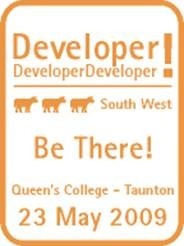 well, there was a Microsoft Developer community event running down in Taunton, free too, so why not attend and see what’s new ? This year there has been a good number of free Community events run, primarily because everyone is aware that most companies are financially strapped at the moment, so realistically, the only way for people to keep up to date on the latest developments is to make it free, and out of working hours. With this in mind, there have been in-person events at Microsoft (such as the Web DD event a month or so ago (see my blog article in the Consultants Blog in SharePoint), and events held by User groups (such as DevEvening in Woking, held in a Pub ). These events have been covering new technologies released by Microsoft (SQL Server 2008, Windows 7 RC), and upcoming products such as Visual Studio 2010, Office 14, and Windows Server 2008 R2. My intention is to write articles about these products (probably not Visual Studio 2010, as you really don’t care about that.). 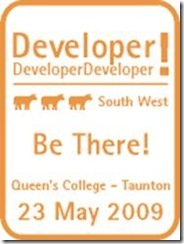 So, the DDDSW (Developer Developer Developer South West!) event was organised by the Developer user group in Bristol. Its the third Developer event in the past few months (with previous events held in Belfast and Glasgow). It covered a number of interesting (actually interesting) topics including the new version of Silverlight (Microsoft equivalent of Flash), the Microsoft Clould platform, Refactoring , the new version of C#and even the video gaming platform that Microsoft have produced. I’ll run through some of these, though I’ll probably stick to the ones that might be relevant. If you are interested in more on any of these, please ask. I’d be delighted to tell you more. Firstly, lets talk about the new version of Silverlight. You might not know it, but silverlight is now on it’s third version, and is used by a wide variety of websites (its a web technology…). It was one of the main technologies used to broadcast the Olympic events from Beijing last year over the internet, and is used to varying degrees to make websites more interactive. 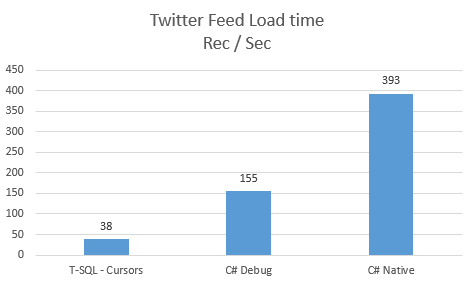 It has a number of advantages over Flash (currently owned by Adobe), in that the installation is smaller, has more functionality available for it, can be created by a far larger group of people (developers) and the resulting Silverlight applications can (but don’t have to be) be hosted by Microsoft (on their servers). This hosting reduces the impact on your web servers, and thereby increases speed. 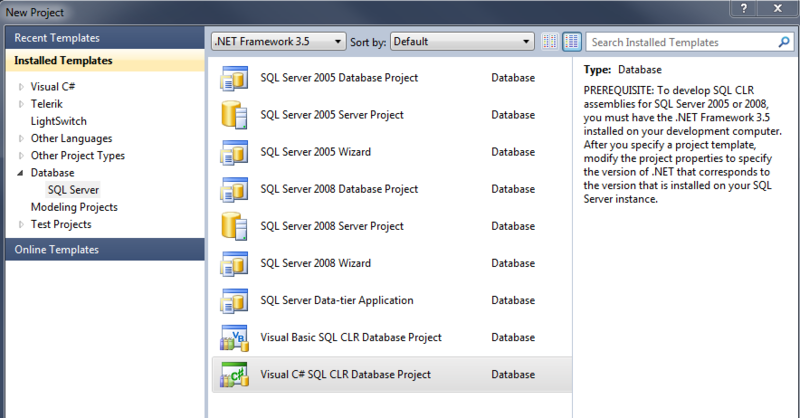 So what does Silverlight 3 give you? It gives a wider range of graphical effects, allows you create standalone applications (right click on the website, and say Install on desktop, useful for any web application) and it also now supports Hi definition Video. You’ll already be aware of the predominance of videos throughout the internet at the moment (not just Youtube, but the majority of websites have some form of ‘moving media’ which is either Flash, Silverlight or Video). Higher resolution screens, mean that low resolution videos look terrible, hence high resolution videos. Azure is the Microsoft Cloud platform, and will be used to support some of the features of the next versions of SQL Server, Office, SharePoint and Dynamics CRM. You may already have heard of the Cloud computing platform that Amazon have (Amazon S3 is online storage, and Cloud computing is available for online virtual servers). Cloud services are becoming more and more widely used as they allow companies to access significantly more computing power and storage than would be economically viable to have in house. The advantage for Microsoft is that you pay them a monthly few (a few cents for gigabytes of storage, or hours on a server). The advantage for the customer is that they don’t need to have all the hardware they might need in the future, it is very highly and easily scaleable (one server this week, 20 next week, with seconds notice), and also that the back up is carried out by Microsoft too (all stored data is replicated in at least three places). Speed of access to these services is then based on the speed of your internet connection. Refactoring is pretty complicated and generally not particularly interesting, even to me, but suffice to say that it makes code and products more reusable by making them more generic. For example, a car or a plane is very specific, whereas a vehicle is more generic, as cars and planes are both vehicles, but they do both have specific features. C# version 4 (when it is released later in the year) gives a wide range of new features, but the most interesting one by almost all the people at the event was that it would allow you greater flexibility with the development of Office applications. Effectively, it would allow you to develop for Office 2003, and the same produced application would work with Office 2007, and Office 14 (in theory) when released. This is an incredible feature, since it means that all the custom work created in Office 2003 (for everyone who hasn’t moved to Office 2007 yet, and there are a huge number) will just need to recompile the code in C#4 (straightforward) rather than re-write it (complete nightmare). There was an interesting session on the Windows Communications Foundation (WCF) also, which talked about new ways of integrating systems together. This is all based around XML, and Web services. Most systems (ERP, CRM, back end systems) have methods for creating or recieving XML documents. WCF enables the interaction of these documents between some system and a custom system. The information therein can be transformed, manipulated and forwarded on to some other system. The Microsoft product BizTalk Server takes this one step further by ensuring that the messages (XML Documents) are completely trackable from the point they leave the source system to the point they reach their destination. This then allows corporate systems such as those used by Banks to be utterly resilient to error. I’m writing this on the train down to Seaford, to see the sea, and my in-laws, and we’re nearly there, so I’m going to stop now. Hope you enjoyed it, and if you have questions, please let me know.